Two years ago today I joined the Children’s Defense Fund-California (CDF-CA) as Executive Director. Founded in 1998 as the state office of the Washington, D.C.-based Children’s Defense Fund, CDF-CA champions policies and programs to ensure that all of California’s children have a head start, safe start, healthy start, fair start, moral start, and successful passage to adulthood – a mission set forth by our visionary founder and president, Marian Wright Edelman. As I reflect on the first two years in service to the unwavering goal of improving the lives of all children I am inspired by the journey thus far – and equally as motivated to continue helping to cement the building blocks necessary for children, families and communities to thrive. I vividly recall my first morning as Executive Director back in September 2014. Walking into CDF-CA’s downtown Los Angeles headquarters was not a novel experience as I worked closely with the organization during my time on the staff of Los Angeles County Supervisor Mark Ridley-Thomas, a stalwart supporter of CDF-CA’s programs and policies. Yet on that particular day I was overcome by a profound sense of history and an even greater sense of the accomplishments that this organization (along with its allies) had achieved in pursuit of justice for children; especially poor children, children of color, and those with special needs. The Education for All Handicapped Children Act, the predecessor to the Individuals with Disabilities Education Act (IDEA), the Adoption Assistance and Child Welfare Act and the Children’s Health Insurance Program (CHIP) are just a few examples of the hard-fought battles which have been engaged (and won) to improve the lives of children. Sponsored SB 882, prohibiting youth from being charged with a criminal violation for transit fare evasion; signed into law by Governor Jerry Brown. As part of the Health4All movement expanded Medi-Cal to all income-eligible children regardless of immigration status, providing comprehensive health coverage to 170,000 undocumented children, culminating nearly 20 years of advocacy and collaboration with a wide range of partners. Fought to secure a two-year extension of funding for the Children’s Health Insurance Program (CHIP), including a 23% increase in the federal match rate, protecting coverage for 1 million children in California and millions more across the nation. As part of our campaign to End Child Poverty we worked hard to help enact California’s first-ever refundable state Earned Income Tax Credit (EITC) to provide an income boost to working families and individuals with very low incomes and successfully advocated for $2 million in outreach grants to ensure eligible families are claiming the EITC. Sponsored AB 2382 which eliminated an ineffective and inequitable truancy penalty placed on poor children in families receiving CalWORKs; signed into law by Governor Brown. Won a ban on solitary confinement in Los Angeles County Probation camps and halls with our partners from the Youth Justice Coalition and other allies. Over the last two years CDF-CA has released various reports and briefs to educate Californians on ending child poverty, highlighted stories and policy recommendations from formerly incarcerated youth on improving the juvenile justice system, promoted strategies to increase healing and reduce trauma among youth, co-authored a critical study to inform greater data on juvenile probation outcomes, and provided a roadmap to level the playing field for all children. Along the way we expanded our youth organizing, chiefly focused on developing the leadership capacity of our CDF-CA Action Scholars; grew the CDF Freedom Schools® program in California to serve more youth in the juvenile justice system and through training shift the cultural norms for those who work within the system; provided a pathway for students of color to not only advance to higher education, but persist in their academic studies, fortified with the tools they need through our Beat the Odds® Scholarship Program; and, understanding the key intersection between health care and education, forged strong relationships with local school districts to strengthen their ability to enroll children in coverage. In addition to the tremendous work we have done through our policy, programmatic, and organizing teams; we have also undertaken important pivots internally to improve our overall operational effectiveness and ensure that we make a positive impact over the long-term. During my first three months on the job I embarked on a listening and learning tour – meeting with a diverse group of individuals to better understand their perspectives about CDF-CA, the overall nonprofit and philanthropic landscape, and to identify potential challenges and new opportunities. Those conversations, often over afternoon coffee and early-morning breakfast, were critical for me as I navigated the first few months and ultimately helped to shape the three core goals that we have focused on to deepen CDF-CA’s impact: (1) realigning our internal operating infrastructure, (2) increasing the visibility and profile of CDF-CA, and (3) diversifying CDF-CA’s fund development. Thomas Edison once wrote that, “Opportunity is missed by most people because it is dressed in overalls and looks like work.” Well, through hard work and a dedicated staff CDF-CA has made considerable progress that includes: opening new offices in Sacramento and Long Beach, hiring additional staff to promote our strategies to level the playing field for all children, retaining a legislative strategist in Sacramento to increase our ability to engage policymakers, redesigning our website and e-newsletter, and deepening our relationships with long-time existing partners – and new ones – who are heavily invested in the success of CDF-CA. With all that has been going on I have been fortunate to travel up and down the state, and across the nation, to take part in – and often times to simply bear witness to – the incredible and collaborative work that individuals and organizations alike are doing to improve countless lives. Like so many others, I am incredibly optimistic that we have the collective opportunity to build a society where everyone, but particularly our children, has an equal ability to lead a full and productive life. Across California we witnessed labor unions, progressive elected officials, and committed allies rise up to fight for a $15 minimum wage. In Sacramento we finally saw the repeal of the regressive and harmful Maximum Family Grant (MFG) rule; a throwback to the days of welfare reform that denied aid to children born into families already receiving CalWORKs basic needs assistance. A persistent fight for transportation equity, led in part by students at Rainier Beach (Seattle) High School and the Seattle Transit Riders Union led to thousands of high school students receiving free transit passes. In Oakland, Fresno, and Stockton dedicated activists and organizations are focused on shifting the paradigm for boys and young men of color. And at the Muhammad Ali Center in Louisville, Kentucky I joined with a group who gathered for inspiration and healing to save our sons and brothers. In Camden, New Jersey hundreds convened at Rutgers University to identify strategies for transforming outcomes for girls and young women of color; persons who are on the front line in advocating for boys and young men of color but are too often overlooked when it comes to recognizing the ongoing struggles they face as well. 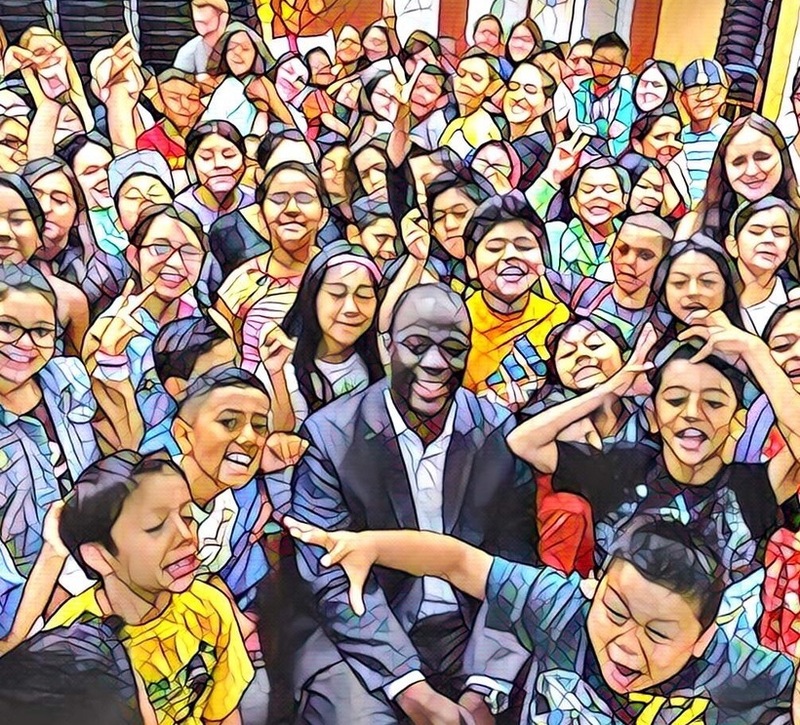 And from Los Angeles to Oakland, San Francisco to Sacramento, Pasadena and Long Beach thousands continue to embrace a pedagogy of high expectations, academic excellence, and empowerment through the CDF Freedom Schools®program. As much as there has been progress, during my travels I am constantly reminded of the vast adversity our children and their families face each and every day – immense poverty, lack of equitable education, systemic violence, continued barriers to access quality health care, and yes – the persistence of structural racism and oppression. California has the 8th largest economy in the world, yet still 1 in 4 children live in poverty. And 1 in 10 children in California live in deep poverty, at less than half the federal poverty line. Over 550,000 children still lack health coverage and Black and Latino youth comprise 75% of all juvenile felony arrests. The data is a sobering exclamation point on the uphill battle that we face. Yes we have come a long way, but we just simply have not gone far enough. When a parent’s zip code determines what school that child attends and therefore has the potential to chart that child’s life outcomes – we have more work to do. When the increase of girls and young women in the juvenile justice system in California is higher than that of boys and young men – we have more work to do. When unaccompanied minors continue to be warehoused in detention centers – we have more work to do. When counselors and mental health professionals are outnumbered by police officers in schools, and little attention is given to student mental health and combating trauma – we simply have more work to do. I remain steadfastly unsatisfied, mindful that we cannot rest on our laurels and yield to the tempting comfort offered by complacency. If we are truly to ensure that all children are afforded the opportunity to succeed, not because of chance or luck but because it is a part of our fundamental value system, then our approach must be comprehensive and focus on the success of the whole child across the life spectrum. We need to recognize that early childhood education is connected to whether a young person finds themselves in a juvenile detention facility or in college; and that untreated health disparities can result in chronic absenteeism, truancy, and poor classroom behavior. Connecting the dots is essential for the long term success of children. CDF-CA will soon release the results of our year-long strategic planning process which will guide our strategies and activities, and focus our impact, for the future. I am excited about the future and CDF-CA’s role in it. CDF-CA has sought to leverage our programmatic work with strong research, policy and advocacy, and youth organizing to alter systems and break down silos. And we have approached this work with an intersectional and inter-generational lens that is rooted in the principle of equity. With that in mind CDF-CA is embarking on some new areas that expand upon our existing work around educational equity, justice for youth, access to health, and ending child poverty. We are aligning our educational equity and juvenile justice work to increase pathways to, and through, post-secondary education for youth in the juvenile justice system. Our health work will increase its focus on the children’s mental health care system and addressing childhood trauma. We will strive to support parents through an intensified effort around parent engagement. And finally, we will launch an effort to promote best practices and policy opportunities for girls and young women of color while maintaining our strong commitment to improving outcomes for boys and young men of color. Thank you for this amazing journey thus far, answering the call to service for California’s children. We Have Come Far but We Have Not Overcome: So What Will You Do Tomorrow to Uphold the Legacy of Dr. King?